For six years the six of us have walked alongside you, our readers, sharing with you our collective knowledge and insights about writing. In many ways, we’ve let you eavesdrop not only on things we have taught you, but on our interactions with each other. We six have something extraordinary, and we know it. One thing that people always notice—and speak of—is the remarkable unity between us. The tenderness and kindness and great affection in our words to each other. The lack of competition, the wholehearted support and love we have for each other. We began the blog as hotshot writers, riding the successes of recently-published books. Some of us won awards, all of us were congratulated by someone. Our agents at Books & Such whose names we bless forever for bringing us together, saw something we all had in common and put us together. And it was love at first sight for all of us. But something has happened to each of us. For some, our salaried jobs have sapped our writing time. For others, we have faced tragedy of startling varieties. Economic realities—and great loss—has been the portion of others of us. And there is more. But what has happened to one of us, we feel, has happened to all. Often for each other flows, as the old song says, the sympathizing tear. We are one. In ways we cannot explain to others, we are one. We are losing ourselves in each other: You’ll not see our individual pictures nor will we sign what we write other than by our collective name, Unity. No longer will NovelMatters be a place to get advice, but to read journal entries, poems, rants, character sketches and scenes that do what writing is supposed to do: show, not tell. And we want, out of the loss and the dark night of our collective soul, to use the gift of language God gave us to talk about the things that authors often don’t talk about. We will end each post without punctuation. We want the conversation to go on, in your heart. We feel the privilege of honesty that will give a haven of fellowship for others. Welcome. Come sit with us. Are you wanting to pray this prayer? I like this. It seems fitting. Right. When I started journeying with you all, some five years ago, I'd never met or spoken to another writer. I'd never read a blog. I was toilet training on small child and nursing another one, spending my days changing nappies and playing dinosaurs, and working on a book after they went to sleep each night. All my friends had returned to work and I was bored out of my brain. I punctuated my weeks by Monday, Wednesday and Friday evenings and prayed that they'd be early posts. I read each post at least three times, usually took notes. After a while something strange started to happen. I said as much to my husband. I wasn't just learning about the craft of writing any more, but God was showing up. Weird stuff started happening...God stuff (especially when that Kathleen Popa woman posted. Gosh, is she like a mind reader?). Lots happened. It ended up being good. Thank you, all, for everything. Thanks for letting us be part of the journey. I had no idea that God could, or would, use a writing blog to do His work, but apparently I shouldn't be surprised. Thank you! Megan, you are such a rich part of this community, and we're so glad that we "found" each other. You've contributed so much, and I pray you will continue to do so. You're a blessing to us, too! I love this. Thank you, Ladies. Let's get vulnerable. I'm ready (maybe). We love your brave heart, Susie. I felt this right along with L'Engle, more recently than I care to think about. But at the end of my raging before Him was His still, small voice: Do. You. Trust. Me? And I found that, yes, I still did. Does this mean we get to post anonymously as well? Interesting! Of all the blogs I started following when I began to try to write, this is the only one I still follow. I may not always comment, but I read every week. I've been there before. Each time He's shrugged it off and eventually proven He had a better plan in mind. These days I may vent and be highly frustrated, but not at Him. Not anymore. But I do know what that place feels like. I don't blame anyone for feeling it either. If anything I might be glad to hear it. How many times have we said the same to our parents? How often have we meant it? How often has it turned into "I love you" in time? It's far from easy, but if we try, it happens. Thanks for being there. Thanks for continuing to be there. Forest, thank you for your comment. It's filled with truth and encouragement. All six of us are grateful for the companionship along the way. Good, bad, indifferent. There is strength in "together". Ever since I read this yesterday I've been debating what to do. Who am I to disagree with all of you? I've been trying to understand why you would post what you did in the first place. Was it to spark discussion? Was it to get a reaction out of people? We're to provoke people to good, not help confirm people in their sin. And yes, questioning God IS a sin! Whatsoever is not of faith is sin (Romans 14:23). And saying that what you posted is a prayer....Christians trust the Lord even in the midst of the most horrendous circumstances. They know that the Lord IS with them and that He truly knows the whys of whatever He's allowing. God can "take it" when we get mad at Him? It grieves His heart that we so quickly forget His loving mercy! The irony of yesterday was I went from reading this comment to typing up my husband's sermon on God's goodness. He quotes passage after passage of tremendous comfort. You could do so much to keep the readers eyes on the Lord and the comfort that only He can give to get us through the hardest of times instead of insinuating that it's okay to not only question God but hate Him. Give me simple, childlike faith no matter what the trials. My gratitude to you all is deep and heartfelt. Ah, but it is okay to question God. Wrestling with Him is part of the relationship. 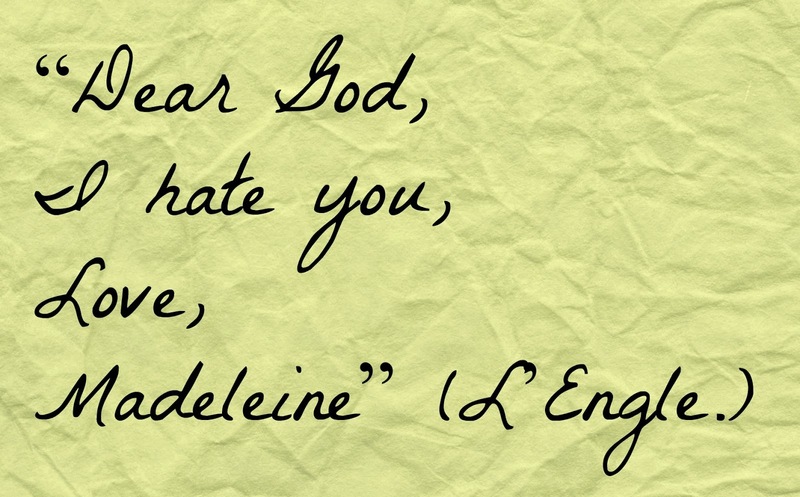 I do believe that the point of the quote is that Madeline doesn't sit and dwell on the "hate" but resolves it with "love". Goodness me, I'm glad I've got the Psalmists who taught me that it's better to be honest about my feelings with God than to mask them. God knows the truth of your pain and anguish, and He can handle it. Honesty before Him is different than turning your back to Him in the midst of it.